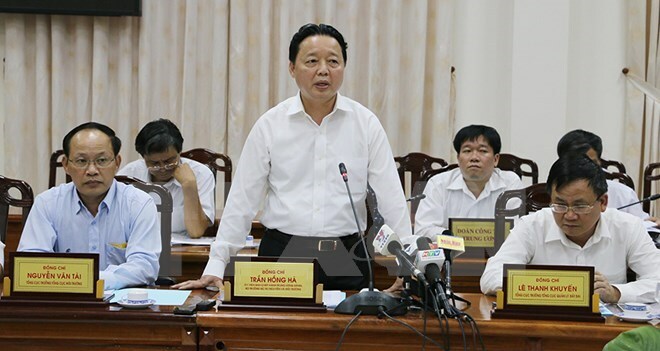 An Giang (VNA) – Minister of Natural Resources and Environment Tran Hong Ha has pledged to submit a plan to the government to promptly launch the second stage of a flood-resistant housing programme in the Mekong Delta. Ha made the promise during a working session with leaders of An Giang province on April 25, which came following a serious landslide along the Vam Nao river in My Hoi Dong commune, Cho Moi district, pulling down 14 houses and forcing many local people to evacuate. At the session, the minister asked the Vietnam Environment Administration to ensure all river dredging and sand mining projects must submit environmental impact assessment reports. Director of the provincial Department of Natural Resources and Environment Tran Dang Duc said the province recorded 20 riverside landslides in 2015 and 18 others in 2016, damaging 142 houses and many other assets with estimated annual losses of more than 100 billion VND (4.34 million USD). He attributed the landslide in My Hoi Dong commune to a natural disaster and asked the Ministry of Natural Resources and Environment (MoNRE) to study the flows of the Tien and Hau rivers to seek solutions to the disaster. According to him, 90 local houses are now at risk of collapsing while 107 households and a mill have been relocated. Initial loss are estimated at nearly 9 billion VND (391,000 USD).